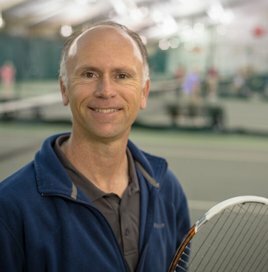 Jason is a USPTA tennis professional who has been teaching tennis for over 20 years and recently received The USPTA Regional Tennis Professional of the year award for 2104. He has a passion for the game and enjoys teaching all ages and abilities. A few of his accomplishments are assisting Bill Beverly on a tennis tip show “Racquet Talk”and playing on a USTA 4.5 team from Portland, ME, that finished 3rd in the Nation. He also served as the co-director for Maine’s Jr Competition Training Center, where elite juniors from around the state were trained and instructed in game strategy with the help of advanced sports science. In the fall and winter Jason is the Co-Director at Maine Pines along with his wife Andrea. Jason’s other interests are spending time with his wife and 6 kids. Andrea started playing tennis at the age of 5 and grew up playing USTA tennis in Massachusetts. She was a ranked in the top 20 in New England during high school and played #1 for her high school team. She went on to play number one singles and doubles at Bates College, where she captained the team through a successful season her senior year. She currently plays on Women’s and Mixed Doubles USTA teams. Andrea has coached 6 years of high school girls tennis along with teaching high school English. She owned and ran the Bridgewater Tennis Academy for two summers. As well, she taught at the Damariscotta YMCA and at Maine Pines summer tennis camps. After taking some time off to raise her 4 kids, she earned her USPTA and USPTR Certifications. 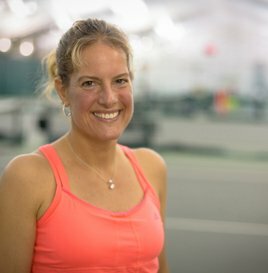 Andrea currently teaches the Ten & Under program (including Preschool and the Schools Program), the Junior Development Program, the 123 Adult Tennis Program, Homeschool Tennis, coaches women’s tennis teams, teaches Private Lessons, and runs Tennis Birthday Parties. As well, she runs a variety of Tennis Clinics such as Cardio, Adult Camp, Triples, and Skills & Drills, and she administers the Tennis Ladder. In 2014 she was the USPTA Regional Pro of the Year, and this year is serving as Vice President of the USPTA Board. Andrea is the #1 Women’s Singles Player in Maine and the current #1 Women’s Doubles Player in New England.